The 12th Annual Festival of Trees returns to the Sidney & Berne Davis Art Center! Experience the beautiful trees decorated by local businesses to raise money for Goodwill of Southwest Florida and SBDAC. See these gorgeous creations for just $2 per person, beginning on November 27th. Plus, take part in a full week of fun with music from the Nowhere Band, Santa’s Block Party, and more! Take part in entertaining holiday events at Festival of Trees from November 27th – December 2nd! The Festival of Trees is a showcase of lovely trees designed and decorated by local businesses, individuals, and organizations. Trees are auctioned and raffled, so attendees could win a beautifully decorated tree! Enjoy a free throwback Christmas concert from the Nowhere Band Beatles Tribute on Friday, December 1st from 6-10pm on the steps of SBDAC. Don’t miss the wreath lighting outside the lovely art center! 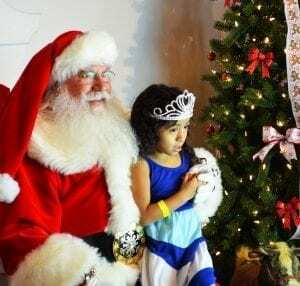 Santa returns for his annual visit to SBDAC on Saturday, December 1st! For just $6, kids can take part in workshops to make arts, crafts, and holiday cards, decorate Publix cookies, and make wood crafts with help from Home Depot during Santa’s Block Party. Brunch will be available for purchase from local food trucks. In addition, kids can take a picture with Santa from 10am – 2pm for just $5. Plus, see the remarkable Festival of Trees before it closes on December 2nd. The complete Festival of Trees calendar has so much in store! Start the week off with the the Breakthrough Awards on November 27th, featuring a cash bar, awards, silent auction, and early entry into the Festival of Trees. Then, on November 28th, Festival of Trees opens, plus that evening, get silly at Find, Design & Wine! In addition, there will be several opportunities to take part in bingo games on Thursday, Saturday, and Sunday. To get a complete schedule of Festival of Trees events, click here.